What Is DD Form 2266? DD Form 2266, Hometown News Release Information is a document used as a medium for providing civilian news media outlets with information about certain outstanding servicemembers. This information may later be featured in articles in the employees' hometown newspapers. 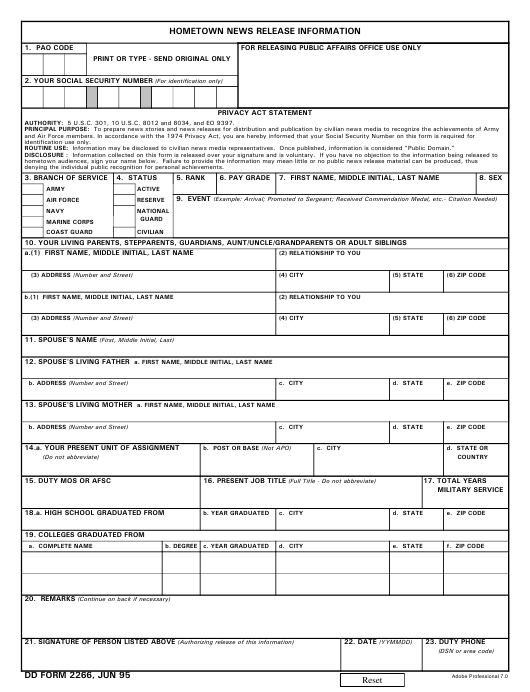 The latest edition of the form - sometimes incorrectly referred to as the DA Form 2266 - was released by the Department of Defense (DoD) in June 1995 with all previous editions being obsolete. Download an up-to-date DD Form 2266 fillable version down below or find it through the Executive Services Directorate website. All service members and DoD employees are encouraged to fill out the DD 2266 after getting promoted, receiving an award, getting selected for special assignments, or having completed professional and educational training. If the military or civilian employee would like to let their hometown know about their acсomplishments, they should fill the form and submit it to the DCMA. How To Fill Out Dd Form 2266? AUTHORITY: 5 U.S.C. 301, 10 U.S.C. 8012 and 8034, and EO 9397. ROUTINE USE: Information may be disclosed to civilian news media representatives. Once published, information is considered "Public Domain." denying the individual public recognition for personal achievements. Filling guidelines are not distributed with the form. DD Form 2266 instructions are as follows. Blocks 1 and 2 are for the PAO Code and the Social Security Number (SSN) of the service member filing the form. Blocks 3 and 4 are for identifying the applicant's branch of service and status. Information about their rank and pay grade is specified in Blocks 5 and 6. The name and gender of the service member is provided in Blocks 7 and 8. Block 9 is used for describing the reasons for filing the form. Block 10 provides information about the soldier's or civilian's living parents, step parents, guardians, or other adult relatives. The name of the spouse - of there is one - is specified in Block 11. Information about parents is provided in Blocks 12 and 13. The employee's present unit of assignment is provided in Block 14. Block 15 is for the Military Occupational Specialty or Air Force Specialty code. The current job title and the period of military service in years are entered in Blocks 16 and 17. Information about high-school and college education is provided in Blocks 18 and 19. Any additional remarks may be entered in Block 20. The applicant's signature in Block 21 confirms their agreement to release all provided information publicly.